The traditional practice of manually managing documents and associated document-based processes presents companies with tough challenges. Documents must be created and archived, deadlines and validities need to be monitored, and the availability of documents must be ensured at all times. Ever shorter revision and distribution cycles are increasingly tying up personnel resources and generate logistics-related costs. Managing documents has become a complex issue, which does not only concern SOP management in a regulated environment. enaio® enables reliable document and process control that is digital, accounts for multiple levels, and delivers accurate results over the entire lifecycle of a document. Documents are available from any location around the clock, are always up to date, and are securely archived thanks to a central database. Monitoring of deadlines, confirmations of notice, in-person training, including a reminder function. Template-based creation of Word documents & auto-conversion to PDF. enaio® supplies a variety of tools from revision to PDF conversion to accompany the lifecycle of a document reliably and flexibly all the way to archiving. 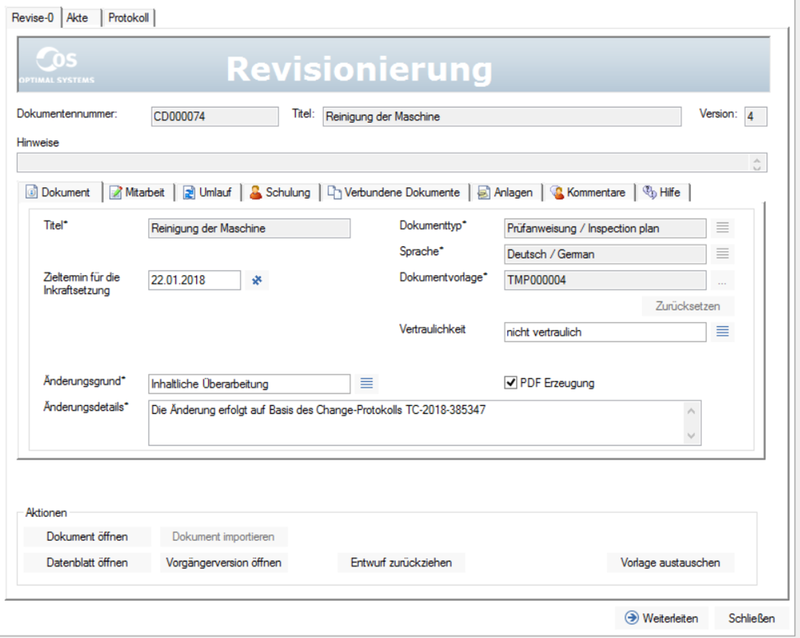 Always keep an eye on the current status and editing history of a document in order to enable full traceability: enaio® ensures reliable revision processes. Order processing, corrective measures, or procedural instructions: Each document is assigned to the corresponding register or record. Complex search requests are a thing of the past. During its lifecycle, a document undergoes a series of steps and procedures: It is created, checked, approved, distributed, revised, archived, and, if necessary, deleted at some point in the future. With enaio® you are well equipped to carry out these process steps and monitor them with ease. The documents are managed exclusively in electronic format. Monitors and secures deadlines for revision, validity, etc. When managing document flows, it is imperative to achieve optimal coordination and seamless documentation of processes. 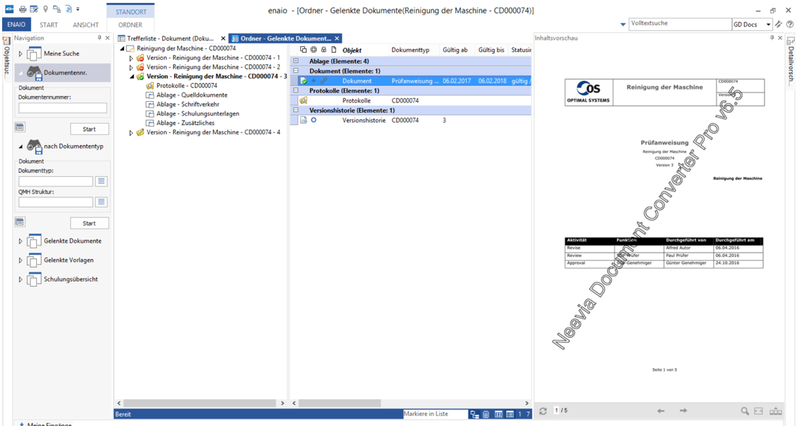 This is precisely what the digital workflows integrated in the enaio® ECM suite do. Digital workflows are used to automatically send documents from the various departments and units to the responsible persons, check them in a multi-stage process, and store them. Various verification procedures, such as electronic signatures and logging of the individual process steps (audit trail), further contribute to meeting compliance requirements. The ECM workflows can be used flexibly, both for structured and standardized processes as well as for individual processes that need to be constantly adapted to new conditions. An additional advantage of digital document control is that it drives knowledge transfer within the company. Document control plays a particularly important role in regulated environments: Pharmaceutical and life science companies are subject to strict legal requirements and standards. enaio® offers special ECM solutions for SOP management in the regulated environment. These solutions fully meet the strict requirements for documentation and process reliability. OPTIMAL SYSTEMS is a qualified supplier who maintains a quality management system with compliant documentation that clearly defines the software lifecycle and project management. As such, the company helps to lessen its customers’ QA-related work. Among other things, the software solution supplies ready-made QM documents for validation. Compliant (long-term) document archiving and management of document flows is indispensable in light of government audits. Paper-based document processes offer little control and security. With enaio® documents are archived in PDF/A format in an audit-proof manner after they have passed through all relevant workflow steps. The solution also ensures that legally prescribed retention periods are observed. For example, GxP-relevant data is generally stored for 10 to 15 years. 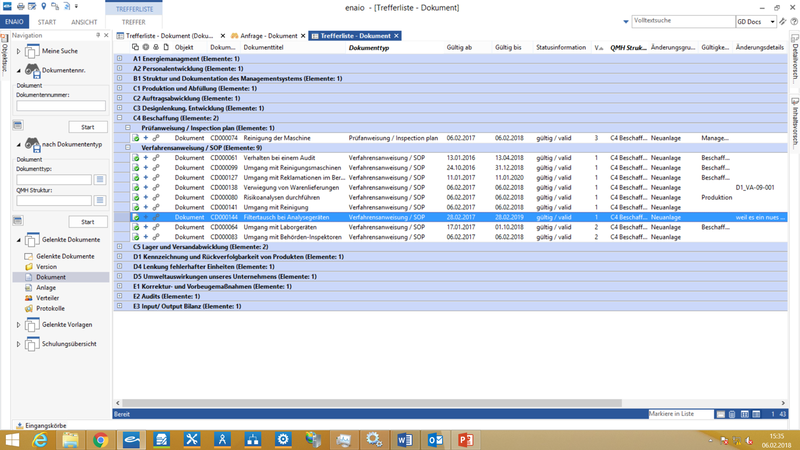 After the retention period has expired, the document can be deleted automatically. As regards archiving, even invalid versions of a document are stored in a compliant manner, including logged accesses. Audit-proof documentation optimizes all business-relevant processes. Detailed change tracking is also part of the package. It is handled via records management over the entire lifecycle of important documents. enaio® allows our employees to find, manage, and archive information more quickly and securely – whenever, wherever, and in whatever format required. Moreover, small adjustments can be made flexibly without the need for new installations or specialist knowledge.